Just got back from my vacation and finally had the time to play with the new Maja collection,Coffee in the Arbour. 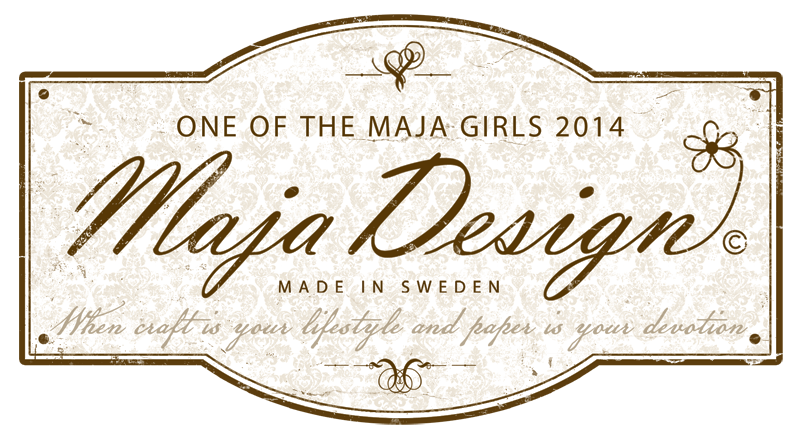 Thought this dress form would be perfect to show that I’m one of the Maja girls and I’m proud of it!! Took me a lot of hours to make all the flowers but I loved every minute to dress this girl! I always use a white background for my project so I was a bit scared to use this colored one but it was the only way to showcase the tulle from the dress. The background are two sheets from the Vintage Summer collection, 1921. The dress form is about 40cm high. I have cut some small stripes of the ‘Raspberry jam cookies’ paper to make the base of the dress. Distressed all the edges for more interest. The body frame was made of a soft fabric filling so I decided to adhere all the papers and flowers with small steel pins. And believe me, there were a lot! LOL! The back side of the dress, using some tulle and a bow. All the flowers were punched and rolled with these papers as well. These flowers were punched and distressed. Used a small bead to pin them on the dress form. Added some lovely lace as well. Made a skirt from tulle and two flowers to hold it open. On both sides I used two beautiful fabric flowers from 13arts. These were left overs from my flowers and I thought they gave the dress a fun and playful touch. The lovely bow on the back. 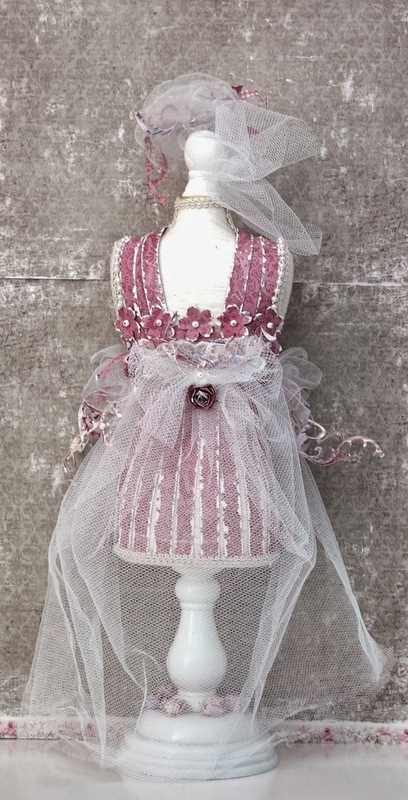 The hat was made with tulle, a fabric flower from 13arts, some left overs and a rolled flower. And of course a metal heart as I just LOVE Maja Design papers! Gorgeous work here hun, soooo beautiful.